Ben. Locke. Jacob. Kate. Hurley. Jin. Jack. Miles. Sawyer. Since I couldn’t invite them over to eat at my place, I decided to have a Lost-themed dinner last night to celebrate the season finale of Lost. The show is filmed on the island of Oahu, Hawaii, where the cast has been shown to eat everything from boar to mango. With an island theme in mind, I set up a menu of slow cooked char siu pulled pork, curried coconut basmati rice with mango and macadamia nuts and dark rum soaked pineapple. The boy took care of the pork for me since he’s home during the day and using the crock pot has become one of the cooking related things he’s pretty okay at. The pork sits in a savory sauce on a low heat for a couple of hours before being shredded and mixed with the well-simmered sauce. Char siu is a Chinese version of barbecue and the sauce itself is comprised of soy sauce, hoisin sauce, ketchup, garlic, ginger and more. It’s a very simple dish to make and the flavor is out of this world. This is the second time we’ve had this char siu pork at home and it’s safe to say it’ll be sticking around. We only slightly deviated from the recipe this time with the addition of more broth and sauce because we had a larger cut of pork. This pork would also lend itself well to sandwiches or steamed pork buns. Below is the recipe as it was published in Cooking Light. Add broth to sauce in slow cooker. Cover and cook on low for 30 minutes or until sauce thickens. Shred pork with 2 forks and put back in slow cooker to mix with sauce. Now comes the time where I pass along a very helpful PSA: This was, hands down, the best rice/grain side dish I have ever had in my life. It was so delicious. Everything went perfectly. I warmed the diced mango before throwing it in so I wouldn’t cool down the rice. The mango was soft, the rice was creamy and the nuts were just salty and crunchy enough to round out the whole dish. I will make this again and again and again. Below is the basic recipe I follow as it was published in Cooking Light without any of my modifications. One thing to note about this recipe is that it says it makes 2 servings but I think it’s enough rice for 3 people as a side dish. Melt butter in a small saucepan over medium-high heat. Add shallots and garlic; sauté 1 minute. Stir in rice; sauté 1 minute. Stir in broth and wine; bring to a boil. Cover, reduce heat, and simmer 15 minutes. Remove from heat; stir in cheese, parsley, pepper, and salt. The rum-soaked grilled pineapple was very easy. I just sliced up chunks of pineapple and let them soak in a mixture of dark rum and brown sugar. 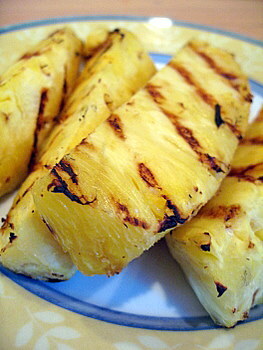 The sugar caramelizes when grilled and adds a really great flavor to the pineapple. No recipe for this one, it really is as simple as it sounds! ~ by canadianbaconette on May 14, 2009.